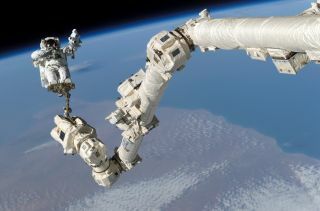 STS Steve Robinson on Canadarm. Without gravity acting on their bodies, astronauts experience massive loss in bone density that is similar to the bone loss seen in elderly people with osteoporosis. Attempts are made to reduce this bone loss through daily exercise. Astronauts have also shown that taking a small amount of bisphosphonate, weekly, further reduces bone loss. Pharmaceutical discoveries like this are already benefiting the Earth's aging population. Infrared technologies were developed many decades ago in NASA's Jet Propulsion Laboratory to measure the temperature of planets and stars. In 1991, this technology was turned into in-ear thermometers. In-ear thermometers provide temperature readings in just a few seconds and have been shown to provide accurate temperature readings, making them ideal for use in hospitals, doctors surgeries and even at home. In-ear thermometers use infrared tech developed by NASA. Translucent polycrystalline alumina. It's a bit of a mouthful. This advanced high-strength, maximum-translucent, shatter-resistant ceramic was developed for defence and aerospace. It was suggested the material could be used for making translucent brackets for braces that would appear tooth coloured. After it was trialled, it became one of the most successful orthodontic products in history.